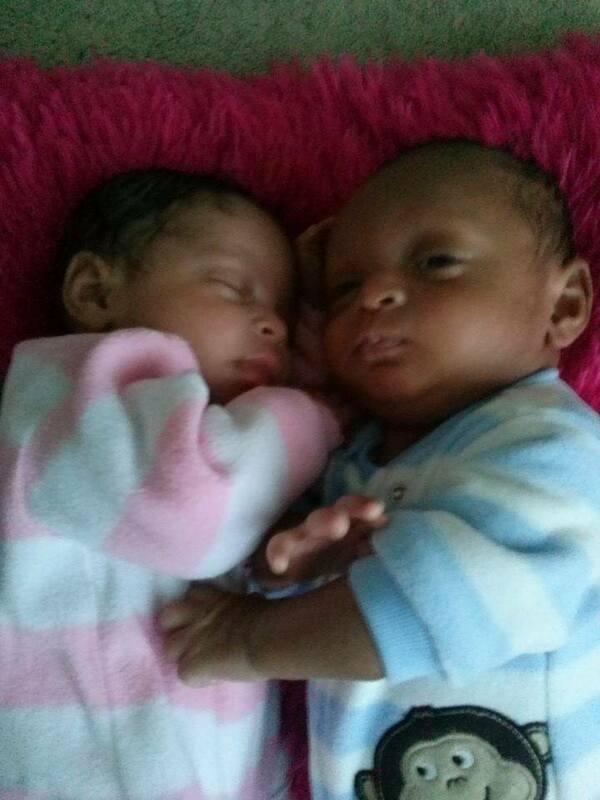 Cassaundra Brown is heartbroken because she is missing her twins' first Christmas. Instead of watching 9 month old Arianna and Dominick delight in the Christmas lights and new toys and pretty bows, she and Warnell Ludington are caught in desperate fight for their babies with DCFS, the child protective services department in Illinois, over what they believe in their hearts is a misdiagnosis. Cassaundra says, "I can't even believe this is happening." The crux of the twins' removal from their parents allegedly lies in an accusation of Shaken Baby Syndrome, a diagnosis which is surrounded by growing skepticism by medical experts, and which does not take into account Arianna's history of medical complications since her birth. Though the parents have reportedly not been charged with any crime, their children have been seized by the state; and they are only permitted to see them for two hours per week. Their visit this week was canceled because the foster parents are out of town for the Christmas holidays. This foster home is the twins' fourth foster home in five months. Their parents are grieving because they are "missing out on every first," and just want their babies back. These babies are my cousins through my father. I have not gotteb to meet them yet, but i have been praying continuously for them and their parents. God preserve and console this family, their case is very similar to my case, Eph 6:12 Says; For we do not wrestle against flesh and blood, but against principalities, powers, rulers of darkness of this world, against spiritual wickedness in high places. Pray without ceasing for the weapon of our warfare is prayer and you will be amazed how God will come through for your family. prayer is the key stay blessed. Given Cassie's medical history, I'm reminded of another recent case that has received publicity. I googled the subject and came up with these links: http://www.vitamindwiki.com/dl675 http://www.nlm.nih.gov/medlineplus/rickets.html http://articles.mercola.com/sites/articles/archive/2014/02/16/infantile-rickets.aspx http://articles.mercola.com/sites/articles/archive/2011/03/26/dr-yazbak-on-the-shaken-baby-case.aspx http://shakenbabyandsuddeninfantdeath.blogspot.com/2010/09/child-abuse-rickets-not-disease-of-past.html http://healthimpactnews.com/2011/are-parents-being-accused-falsely-of-shaken-baby-syndrome-to-cover-up-vaccine-injuries/ http://www.vaccinationcouncil.org/2012/02/09/bone-density-shaken-baby-syndrome-part-2-by-catherine-j-frompovich/ Please, file and share these for rapid intervention in future cases. I weep for this family and pray for the tortured parents who have been convicted of child abuse. It must be stopped and it's up to all of us to see that the system gets changed. Thanks for all the good comments. Was this mom put Magnesium Sulfate for premature labor, preeclampsia or eclampsia during pregnancy? The FDA put out a warning on this drug May 2013 because it causes fractures in the baby. The FDA statement can be easily found by typing FDA and magnesium sulfate into Google. Im praying for your family and can't imagine the anguish you must all be going through. They are beautiful children and need to be with their parents. I pray the "officials" return them promptly. IJN. This IS Nazi Germany.....Hitler gave high pay and high ranks for doctors who were willing to go along with his plan to wipe out the Jewish race.This is what this is all about.Americans need to wake up,brush up on your German/Hitler history and read the news in a new light.We are REPEATING the most atrocious history ever written.It started with doctors then and now it's starting here.Doctors aren't to be trusted any longer,that's the message they are giving every time they do this to a family.They can NO LONGER BE TRUSTED.Neither are hospitals to be trusted! I have just been to the website Vaccine impact. com and read the article about Dr. Andrew Moulden: Every Vaccine Produces Harm by John P. Thomas. In the article Dr. Moulden asserts that Shaken Baby Syndrome is actually caused by vaccine damage. This information is vital for parents to have to protect themselves from being accused of child abuse. If parents refuse to vaccinate their children they run the risk of losing custody of their children. If parents allow their children to be vaccinated and the infant shows signs of Shaken Baby Syndrome they run the risk of losing custody of their child. What a dilemma. The article on Dr. Moulden is a must read. This courageous and outspoken doctor died unexpectedly just before he was going to release results of his research which would have turned the vaccine industry on its head. Much of Dr. Moulden's work has been removed from the internet. However, there is still sufficient information to help parents challenge the diagnosis of Shaken Baby Syndrome. Prayers are sent your way. What a devastating story. My God this is heartbreaking!!! I am so sorry for your situation, yet angered at our atrocious system that separates innocent families and destroys lives without even performing a thorough investigation. The damage done by CPS to these poor babies is clearly evident. I would get an attorney and sue the pants off the medical system and CPS for the damage done to your children and your livelihood. Our country should not profit from children, especially profit from breaking up families or profit from being completely inept. They have too much power and parents don't have enough. I'm praying for your family and the thousands of families across the country (and continent) that the numbers of parents are greater than politicians and our influence becomes stronger than governments or lobby groups for corporations. We need to demand change and demand it now. This is absolutely terrible! My heart breaks for this family! I pray this madness will end. All vaccines are PROVEN to be infectious in the infections that always caused all syndromes. In fact they know over 95% of the pops have the antigenic variation from Hades that is Epstein Borreliosis and why there is no vaccine for it or any other that doesn't infect. Hire a good lawyer who knows how to fight with real science. I don't live in Illinois, but I have taken time tonight to write to the above three people and request that they look into this matter. Things of this nature need to stop. There is a time such action should be taken, BUT not when all the facts are not looked into, heard or duly noted. I am not a medical doctor or claim to be anyone who knows much about illness, but I do know what lupus, low bone density is...I have friends who suffer from these. As a normal non medical person I know that if these illiness run in the family then they need to be serious taken into consideration when a child's health is poor. Instead of jumping to the first conclusion. Having learned the hard way it is far better to look and take in all the facts before jumping straight in because you never know just how deep that puddle is. **I'll get down off my soap box and end with this. I am praying for everyone involved in this. The Lord knows all and sees all. Trust him for the answer even when it seems slow coming. He sees these two precious babies and will be with them. I will share this story. Do the additional testing the parents have requested. This medical kidnapping has to stop! Too many children being taken from loving, caring parents. The state of medical care for children in this country is wrong on so many levels: Lack of adequate prenatal care, one in eight babies born premature, over use of vaccines and misdiagnosis of so many vaccine injuries OR inborn errors of metabolism as "shaken baby syndrome," I'm embarrassed that this kind of response needs to be written in 1914....oops, 2014! Many in the alternative medical field will recall the horrible case of Alan Yurko and his baby Alan, who died unfortunately, about 14 years supposidely from "Child abuse." (The story has been covered by Gary Null, Nutritionist and investigative journalist in his documentary, "Vaccine Nation," and many other news stories, such as here: http://www.vaccinetruth.org/hannah.htm. In previous issues of Health Action News, you may have read about how "Sudden Infant Death Syndrome," is really not much more than infantile scurvy, almost always instigated by vaccine use in young babies. Here, Health Action News, is leading the charge in waking up Americans--some Americans at least, to the serious deficiencies of quality care, the overload of child "kidnapping cases," that makes us think we're in some undeveloped, primitive country, and the serious lack of insight as to the numerous OTHER things that can be going on BESIDES CHILD ABUSE, that can cause what appears to be injuries in children. Even James Lind (British Sailor who in the 18th century discovered limes to cure scurvy in his sailors), found his sailors to have numerous bruises over their bodies, NOT from being beat up, BUT from having scurvy. ALL these nurses (whom I will not call names, although I want to), should be quizzed: "Do you know what scurvy is?" The next question should be, "WHAT IS THE VITAMIN C BLOOD LEVEL OF THIS CHILD WHEN TAKEN FROM THE HOME? WHAT WAS IT AFTER THREE DAYS IN THE HOSPITAL? Bet they don't know the answer! And i would guess it's almost non-measurable, that's what I would say. Why is it that we're so fast to want to blame someone for a child's problems, instead of taking a deep breath and Thinking? Showing Compasion? Assuming someone is innocent until proven guilty?! I pray to that this family gets their twins back and...soon!